This is a copy of an article published in the High Altitude Medicine & Biology � 2010 [copyright Mary Ann Liebert, Inc.]; High Altitude Medicine & Biology is available online at: http://online.liebertpub.com. Grocott, Michael P. W., Daniel S. Martin, Mark H. Wilson, Kay Mitchell, Sundeep Dhillon, Monty G. Mythen, Hugh E. Montgomery, and Denny Z. H. Levett. Caudwell Xtreme Everest Expedition. High Alt. Med. Biol. 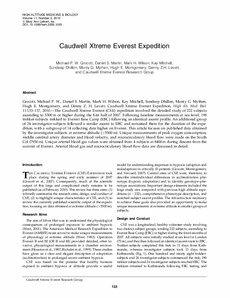 11:133-137, 2010.-The Caudwell Xtreme Everest (CXE) expedition involved the detailed study of 222 subjects ascending to 5300m or higher during the first half of 2007. Following baseline measurements at sea level, 198 trekker-subjects trekked to Everest Base Camp (EBC) following an identical ascent profile. An additional group of 24 investigator-subjects followed a similar ascent to EBC and remained there for the duration of the expedition, with a subgroup of 14 collecting data higher on Everest. This article focuses on published data obtained by the investigator-subjects at extreme altitude (>5500m). Unique measurements of peak oxygen consumption, middle cerebral artery diameter and blood velocity, and microcirculatory blood flow were made on the South Col (7950m). Unique arterial blood gas values were obtained from 4 subjects at 8400m during descent from the summit of Everest. Arterial blood gas and microcirculatory blood flow data are discussed in detail. © 2010 Mary Ann Liebert, Inc.